Policy-makers and experts from all sectors are discussing ways to finance the 17 Sustainable Development Goals . This dialogue is testament to an ongoing paradigm shift in the thinking about development finance: today, there is a clear focus on how to remove constraints, mitigate risks and unlock the resources needed to move from billions to the trillions required to achieve the new development agenda. Providers of official development assistance, working in partnership with the private sector, can play a key role in underpinning commercially viable, sustainable and scalable solutions. They can use public funds strategically to provide, for instance, de-risking instruments; these instruments can incentivize private finance for investments with strong social and development benefits that would otherwise not materialize due to higher actual or perceived risk. Operating at the intersection of fully commercial and subsidized/grant-dependent projects, they can move the needle towards self-reliance, viability and scalability. This is the concept behind what is referred to as “blended finance”. Where development challenges or perceptions of risk prevent investment on purely commercial terms, these models can enable the private sector to balance certain risks with appropriate rewards. This, in turn, can connect target groups to the market and eventually enable solutions to become financially sustainable. For multistakeholder partnerships to have the desired development impact, both public institutional expertise and emerging market knowledge are essential; together they permit the identification and structuring of projects that can be sustainable and replicable in the long run. Blended finance investment solutions capitalize on partnerships among diverse actors, including international organizations, development cooperation agencies and private enterprise. An example of such a partnership is the Women Entrepreneurs Opportunity Facility, launched in March 2014 by the International Finance Corporation and Goldman Sachs’ 10,000 Women. This is the first of its kind of global facility dedicated to expanding access to capital for women-owned small and medium enterprises. Through the facility, the International Finance Corporation aims to invest up to $600 million in financial institutions that are committed to expanding their financial services to small and medium enterprises owned by women in emerging markets. It also aims to signal the relevance of this asset class to the broader investor market. The funding for the facility includes $50 million of blended finance from Goldman Sachs’ 10,000 Women to create performance incentives for financial institutions to boost their lending to this segment, and to support capacity building among financial institutions and women borrowers. 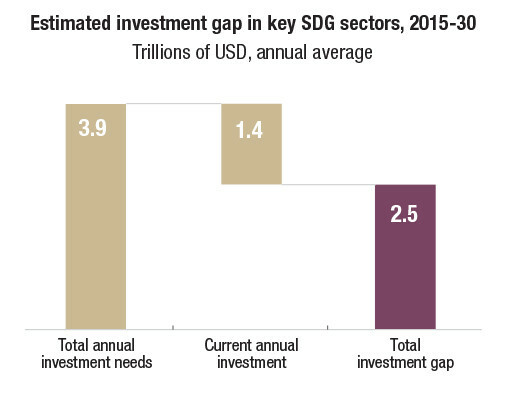 Nonetheless, it is important that the growing focus on blended instruments within the post-2015 development agenda does not lead partners to overlook other financial vehicles that can deliver commercially viable outcomes without a concessional element. The range of tools available to catalyse private finance for development includes instruments such as market-priced co-financing, seed capital for collective investment vehicles, partial risk guarantees, advisory services and support for sound project structuring. Some of these tools depend simply on an alignment of interests rather than the provision of an explicit subsidy. Blended finance solutions are best used when partial market failures undermine economic efficiency, including pioneering investments in high-risk environments or those that use new technologies; or when equity or distributional goals prevail, such as promoting affordable access to basic services for underserved groups. 1. Identify and structure projects where blending is needed to make projects viable and ensure that the concessional element can be phased out in a reasonable time period, leading to commercially sustainable projects. 2. Target projects that address critical gaps in development and can be scaled up and/or replicated to yield significant benefits beyond the original undertaking. This is particularly important for projects in fragile and conflict-affected states. In essence, blended finance implies that certain policy-driven investors take on a higher level of risk, without commensurate commercial rewards. These partners are compensated by the prospect of strong development impact, of demonstrating the viability of new sectors, and of attracting additional commercially-driven private finance to fund development challenges. This article is one in a series of opinion pieces on issues covered in the OECD Development Co-operation Report 2016: The Sustainable Development Goals as Business Opportunities .